long-term plan FOR THE FUTURE of the community. YOUR INVOLVEMENT can help shape the future of the DALLAS CITY CORE. Urban planning and city building becomes the collective work of agencies, stakeholders and individuals. to develop the Dallas City Center Master Assessment Process "CityMAP"
to identify neighborhood redevelopment, preservation, and transportation scenarios for a comprehensive vision for the city's future. and across these roadway corridors. When the concepts of “compact city” and “smart growth” were first advanced in the 1990s, the conventional wisdom was that roadway capacity and livability at the neighborhood scale were incompatible. Today, after a generation of evolved thinking by urban planners, engineers, neighborhood leaders, economic developers, city leaders and other stakeholders in the business of city-building, the art of city design has embraced a context-sensitive approach to transportation and neighborhood design that recognizes that roadway capacity and livability are not competing objectives. 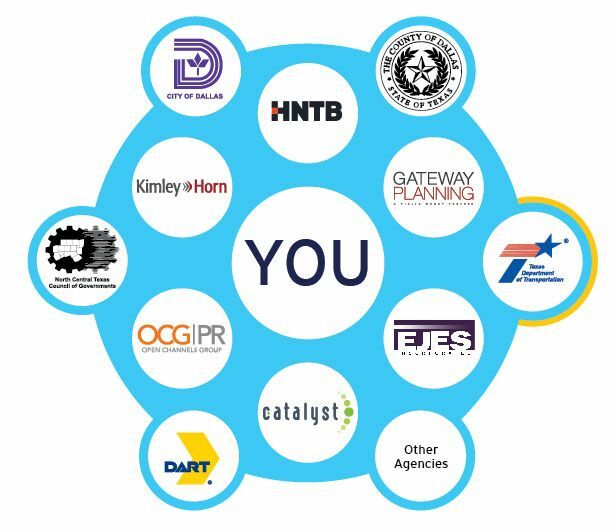 The Dallas CityMAP process is an open and inclusive assessment of the challenges, opportunities, and potential solutions for the aging interstate corridors and adjacent neighborhoods. A critical component of the Dallas CityMAP process was receiving input from key stakeholders. Over a nine-month period beginning in March 2015, interviews were conducted in a free form interview style to allow stakeholders the opportunity to communicate ideas and visions of importance to them. As a result, a wide range of ideas and topics were discussed. Residents and businesses in the core of Dallas made it clear that the reinvention of the major interstate corridors provides an opportunity to enhance connectivity and quality of life. CityMAP responds to the shared community goals of maintaining a robust regional transportation system and economic vitality with a desire to reknit the neighborhood fabric in a contemporary way that returns to the renaissance of urban living. The aging and, in some cases, obsolete interstate corridors entering and looping the urban core of Dallas provide both a challenge and an opportunity for TxDOT, the City of Dallas and other public and private stakeholders. These corridors need more than safety repairs, increased capacity and updated designs. They should also respond to a downtown that no longer serves merely as a Central Business District. Long considered simply a way to "get there," urban interstates take on new meaning as communities like Dallas struggle to replace their transportation infrastructure and create a more integrated future. Changing views and expectations for greater neighborhood and regional connectivity and livability are motivating communities to examine both traditional and innovative mobility solutions. City building takes time. Let's get started. Be part of Dallas CityMAP.